Regarding an article in the Spokesman Review this morning about the soldier returning home in return for the release of five Taliban detainees being held in Guantanamo since 2002. The detainees – Muhammad Fazl, Mullah Norullah Noori, Mohammed Nabi, Khairullah Khairkhwa and Abdul Haq Wasiq – were mostly high-ranking officials during the decade before 2001 when the Taliban ruled Afghanistan. Set aside, for the moment, that Guantanamo is hardly the poster child for human rights, that many detainees there had nothing to do with terrorism, and that the Taliban, as horrible they may be in Afghanistan and Pakistan, had nothing to do with 9/11. 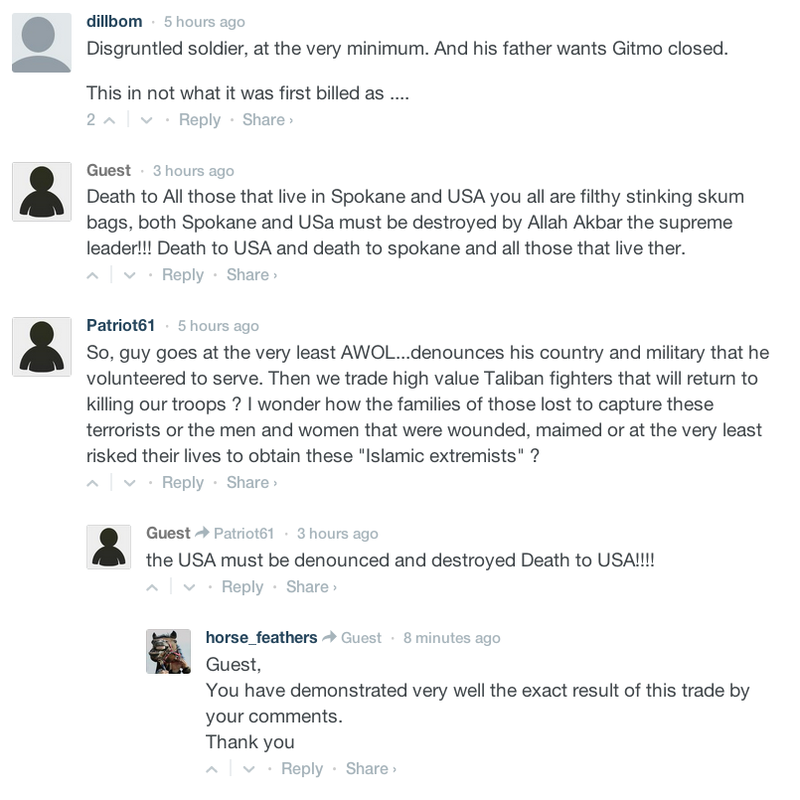 A guest commenter – a troll – has chimed in, playing the role of the Islamofascist Taliban Al Qaeda terrorist. Waiting to see how many people take the bait before the comments are removed.